As the healthcare landscape continues to move toward a customer-centric approach, there’s a lot healthcare can learn from retail. More specifically, lessons from retail call centers offer the healthcare sector best practices to provide better personalization in their engagements with consumers and patients – before and after clinical encounters. 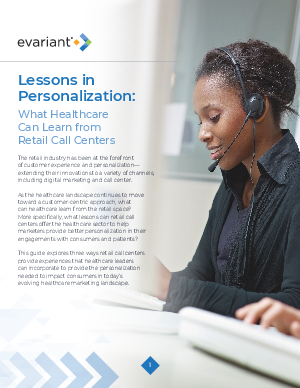 This guide explores three ways retail call centers provide experiences that healthcare leaders can incorporate to provide the personalization needed to impact consumers in today’s evolving healthcare marketing landscape.